The latest review from property adviser, GVA, indicates that mainland European investors appear to remain risk-averse to the UK commercial property market, as a result of the continuing uncertainty surrounding the Brexit negotiations. In contrast, other global investors, particularly those from the Far East and China, remain bullish, with demand from these regions strengthening in 2018. At the same time, UK based investors appear to have returned to the market this year and now account for approximately 12% more acquisitions compared to last year. London remains the prime location for investors from outside Europe, but the North East has seen competitive bidding for prime, well-let assets, with an apparent lack of this type of property in that region at present. Overall, the review finds that the UK commercial property market remains attractive, with the exception of retail assets. According to estate agents CBRE, central London saw a surge in demand in October for office space, with approximately 1.3m sq. ft of office space let, marking a 30% rise on the same month last year. This was primarily driven by the UK creative sector, who were responsible for nearly 20% of all deals contracted. The largest deal of the month saw US advertising agency, McCann Erickson take 146,400 sq. ft at 135 Bishopsgate in the Square Mile’s eastern area. The bi-annual LOGIC Regional report from Knight Frank, which studies the occupier and investment market trends in the industrial and logistics sector, has revealed that the first half of 2018 saw 17 million sq. ft of industrial and logistical space acquired by participants in these sectors. Given that most online logistics operations – who commanded 17% of retail sales in June 2018 – centre their distribution operations from the Midlands, it is no surprise that this region enjoyed 43% of take-up of warehouse space across the UK. On the supply side, availability has increased slightly with new developments, that are over 100,000 sq. ft, both underway or recently completed, reaching 10.6 million sq. ft at the end of June 2018. 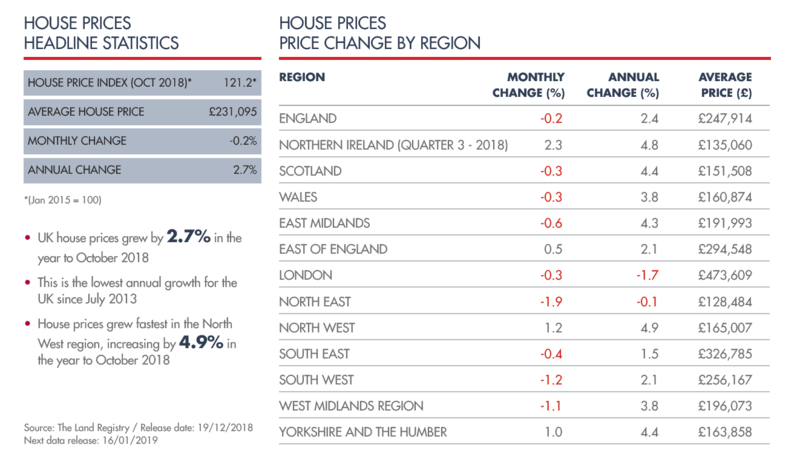 Although this figure is a 20% improvement on the first half of 2017, it remains 7% below the 10-year average. Although there is a 1.2% deficit between the Scottish and the overall UK total annual returns, with Scotland showing 7% against the UK average of 8.2%, three sectors of Scotland’s commercial property market, ‘offices’, ‘retail’, and ‘alternatives’, are ahead of the UK average. Notably, the high street retail sector in Scotland shows total returns at 6.4%, against the UK average of only 4%. This latest data, released by CBRE, shows that that the ‘industrials’ sector has bucked the trend due to exceptional rental performance in London and the South East, with UK total returns here showing an impressive 19.3% for the year ending September 2018 against Scotland’s lower 8.4% return.